Review: Bri is the most popular girl in school and Sara is her faithful friend. Bri feels threatened by Emma, the pretty new girl who is hooking up with a lot of different guys, and starts bullying her. Sara quickly joins in on the bullying when Emma goes after her boyfriend. Things spiral out of control and Emma commits suicide. Bri, Sara and a few others are charged for their actions. 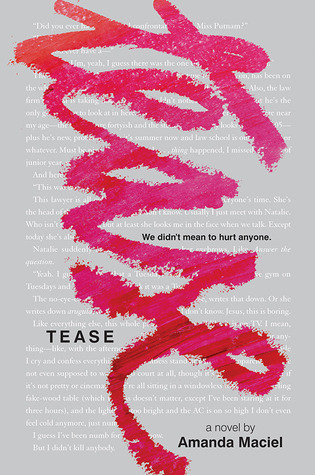 Tease is written in two timelines, both from the POV of Sara. In the older timeframe, she is Bri's dutiful minion with little to no backbone. She willingly does Bri's bidding and it's sad at how she allows herself to get caught up in things. Readers (at least me) are left with a sense that without Bri, she would not have acted in such a malicious manner. In the present timeline, Sara is meeting with her attorneys on her case. Make no mistake-she is not a repentant defendant. If anything, she feels like the victim here. She didn't kill Emma, Emma killed herself. And the bullying? Well, Emma was asking for it after all. And she and Bri were just playing jokes on her, she didn't have to take it so seriously. This book's strength is that there are no good and bad characters. Every character (including Bri and Emma) have flaws and reasons for why they behave certain ways. It is difficult to sympathize with our narrator, Sara for most of the book. I wanted to yell at her repeatedly (make your own decisions! Think about what you are doing!). Overall-this was not a pleasurable read per say, but very relevant and thought provoking given the anti-bullying campaigns going on in almost every school across the country. And the sad fact that there are still teens killing themselves over this kind of abuse.